Yesterday waked up so lately,because I slept on satuarday lately as we had a party on saturday night.After that we played a cricket match,so after long time we palyed cricket again in US(played long back, ie before 2 months).In the evening ,thaught of watching cricket ie India vs England whichheld on Indore.This time I thaught that England will bounce back on India .India bat first ,it lost 3 early wickests ie sehwag,rohit and raina.It's Yuvi and Gambhir who played consistently ,ie they both hold for 4th wicket for 134 runs.Yuvi once again played exquisite innings with 118(122 balls) with 15*4's nd 2*6's . Lastly Yusuf Pathan smshed in slog overs(ie 50 in 55 balls),so India ended the game with a score of 291/9 50 overs. Next England started their game losing their ealry wicket ie Ian Bell.2nd wicket holds for 96 runs between Prior and Shah.This time Yuvi also done magic with bowling with 4/28. 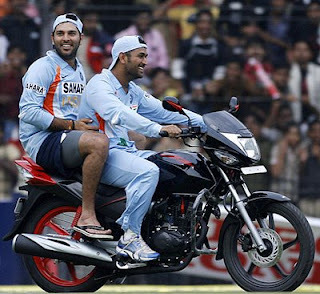 At some movement ,Game is on england side when KP and Flintoff are in the field to bat.But those partnership was broken by Yuvi.He took key wickets(Shah,KP,Flintoff,Prior).Sehwag took 3 wickets.England was allout on 238.Yuvi was again declared as man of the match.